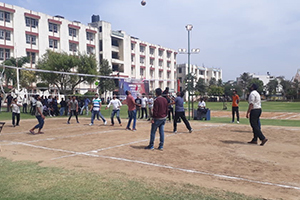 Rajasthan Institute of Engineering & Technology organized a one week long mega fest in which Sports,(12th& 13th March, 2019), tech-Fest-Carnival 2019 (on 14th and 15th March, 2019) and Annual Day on 16th March 2019. 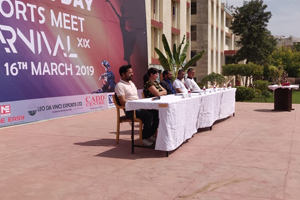 On 12th March, the inauguration of the national level mega sports meet- ESPORTES 2K19 was held in the campus with great enthusiasm and vigor. The chief guest on the occasion was Shri Gopal Saini who is a former Indian middle distance runner. He holds the current national record in 3000 meters Steeplechase which is unbeaten till date. Shri Gopal Saini set the 3000m Steeplechase record (8:30.88) in Tokyo, Japan on 5 June 1981.He represented in 1980 22nd Olympic Games in Soviet Union for men’s 5000m race. Shri Gopal Saini hails from Rajasthan. He was conferred Arjuna award in 1981 for his achievements. 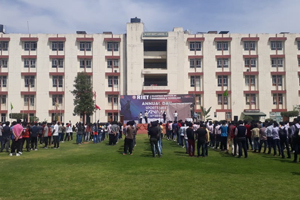 Dr Saroj Hiranwal, Principal RIET, Prof. KapilDev Sharma, Dean Academics & Administration, RIET, Dr. Sachin Sharma, Vice Principal, RIET, T&P Advisor, Prof D D Johari, along with all the respective HODs and faculty members participated in the inaugural event on this day. The inaugural event started with the lightening of the Traditional Lamps for the lamp lightening ceremony. 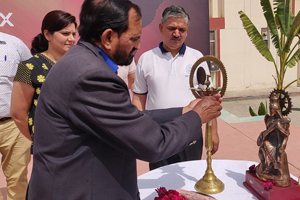 The chief guest Shri Gopal Saini was welcomed byProf Kapil Dev Sharma, Dean Academics & Administration, RIET with a garland, Dr. Sachin Sharma, Vice Principal, RIET, felicitated him with a shawl. 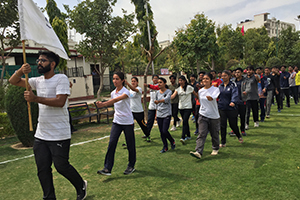 RIET felt one and united with one spirit of togetherness that bound all athletes together, as all paid homage to the college flag. 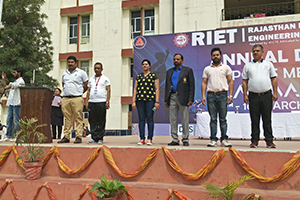 The chief guest Shri Gopal Saini unfurled and hoisted the RIET sports flag and took the salute. 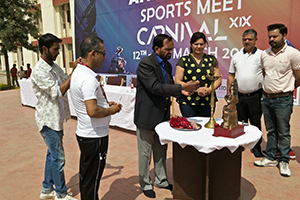 In the inauguration ceremony the sportsman’s oath was taken by the participants, who pledged to uphold the spirit of true sportsmanship in the entire tournament.The oath taking ceremony was conducted by sports officer RIET, Shri Uday Choudhary. March past is all about synchronization and team work. Marching in a contingent demands alertness and an unspoken co-ordination. The drumbeat rolled and the band struck up and an authoritative voice issued a command. The synchronized swing of Arms and the sound of thudding feet stirred energy within all. Besides being Spectacular, there was something enigmatically inspiring about the March past which gave a sense of dignity and pride which the RIET cadets brought to it. Warming up helps prepares our body for sports activity. A warm-up gradually revitalizes cardiovascular system by raising body temperature and increasing blood flow to the muscles. Warming up may also help reduce muscle soreness and lessen risk of injury. 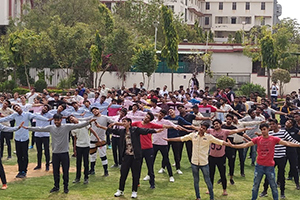 Keeping all these in mind a ZUMBA DANCE warm-up was conducted in which all athletes, students, HODs, Faculty Members along with the dais dignitaries joined in with great enthusiasm. 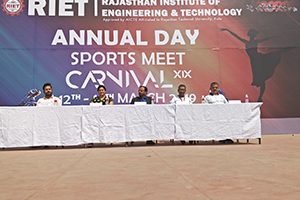 The chief guest on this occasion, Shri Gopal Saini, shared his life time experiences about the Olympic and Asian games and encouraged all the young sports persons and technocrats to inculcate sports in their everyday lives. 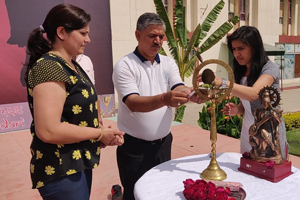 In her speech on the occasion of the inauguration event DrSaroj Hiranwal, Principal RIET, said that extra-curricular activities including sports are an essential ingredient of the overall education process. As they say, sound bodies possess sound minds. The organization is happy and proud that the students have achieved laurels in both in studies and in athletics. 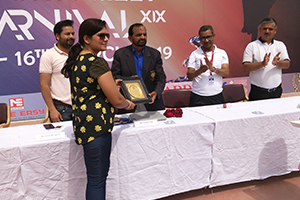 She presented a Memento to the chief gust Shri Gopal Saini. 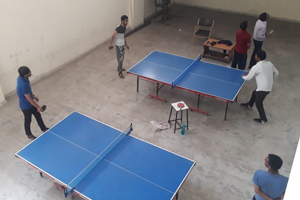 Prof. Kapil Dev Sharma, Dean Academics & Administration, RIET, said that, Participation in sports can help build self-esteem, confidence and can motivate students to excel academically and can help build their social skills. It can even teach young learners the ways and benefits of goal setting & practice. 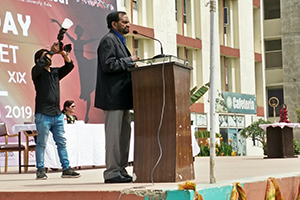 Dr. Sachin Sharma, Vice Principal, RIET, encouraged all participants and congratulated all the contestants. He also extended the vote of thanks on this occasion. In these two days of sports extravaganza RIET shall witness huge participation from across Rajasthan. 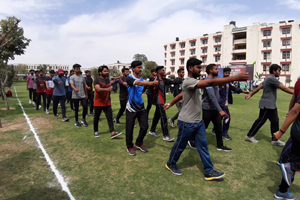 As per registrations received, more than 100 teams from various colleges and universities of Jaipur and outside Jaipur who will participate in this athletic meet. 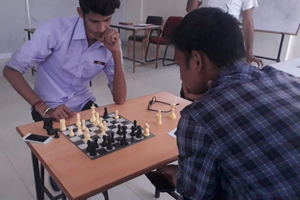 The inaugural event ended with a happy note with eager awareness of the coming two days of sports full of all sorts of games and enjoyment.